A dynamic sculpture provides numerous paths for colorful marbles to follow as they roll down hill through a series of ramps, loops, drops, turns and gates. 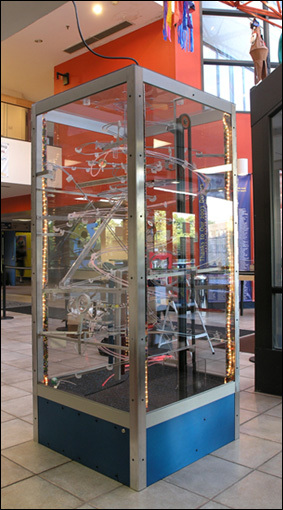 The interactive sculpture is set in a clear lucite case 3 feet square and approximately 7 feet high. Interaction points are accessible through the case. Visitors can release marbles into the flow, ring bells and stay engaged until a grownup says they have to go. An elevator lifts the marbles to the top where they begin their round trip again.